Are these not the cutest melting snowman cookies you've ever seen? Mix cookie mix according to directions, or prepare your favorite cut out sugar cookie recipe, then just grab a tablespoon sized ball and squish it down until it's about 1/4-1/2 inch thick. Do not worry about the shape or how lumpy it is, the more misshapen the better. Bake according to recipe directions. Once the cookies are cool, load them up with the cookie icing and spread it around with the back of a spoon, let some dribble over the edge for a "puddle" look. Spray a microwave safe plate with cooking spray, and place marshmallows on the plate. Set the microwave for 30 seconds, but watch the marshmallows as they cook. Stop the microwave as soon as the marshmallows start to get puffy, do not let them double in size. Spray your fingers with cooking spray or grease them up with a little butter, and carefully pull the marshmallows off, by the base, and set them on top of the frosted cookies. 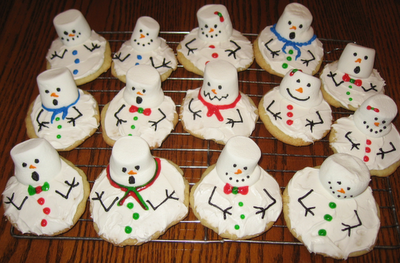 Then just decorate as you'd like with the icing, or your own homemade frosting! This is just so cute, and easy! Love it!!!!!!!!! We thought so too :) Hope you get a chance to make them because they are yummy too! Saw this post on Facebook. LOVE, LOVE, LOVE this idea, going to figure out how to do it gluten free for my kids.